Though we haven’t posted much lately, we haven’t stopped shedding. One irritation we celebrate ridding our lives of is our recurring underground water leak. Casa de WIST isn’t all that old; it was built in 1987. That was the year Nimue and I met, in graduate school in Chicago. In the American southeast (where we now live), lots of new homes were going up, and not a few of them were plumbed with polybutylene pipe. It appeared to offer a great advance over copper and galvanized steel: it was cheaper and, since it’s flexible, quicker to install. 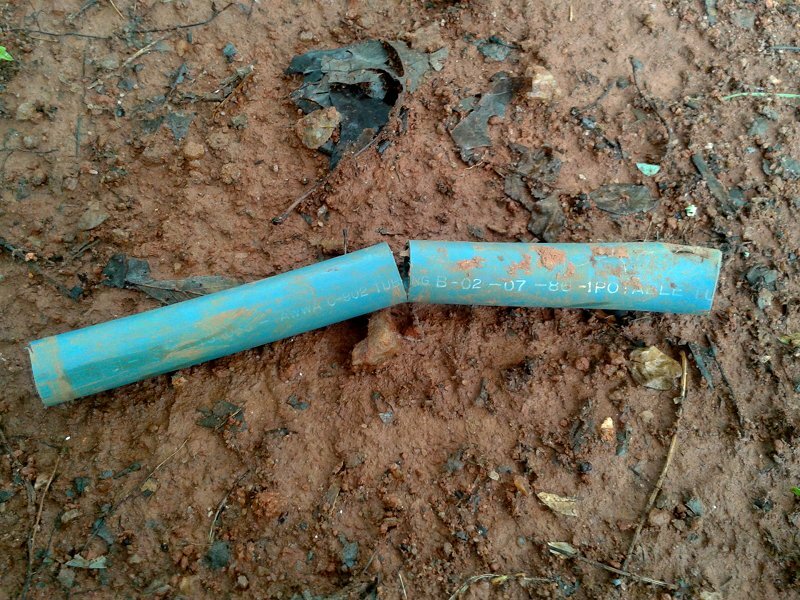 But out “in the field,” polybutylene hasn’t held up well. The typically grey or blue material gets brittle and develops small cracks that soon widen into large leaks. Thousands of lawsuits about it cumulated in a massive class-action settlement. We bought too late to get a slice of that, but nevertheless consider ourselves among the more lucky inheritors of the legacy; the pipes inside our house are copper. But between the city’s water meter and our foundation wall, we had a polybutylene supply line. Nimue keeps a close eye on our utility bills, and thus our consumption of water and electricity. About two years after we moved in, our water use crept up. For one or two months we shrugged it off; maybe we’d washed a lot of clothes or something. But when it continued, we suspected our water line. I confirmed that we had a leak by shutting off the supply (there’s a valve in the crawlspace under the house) and watching the needle on the city’s meter. It kept slowly moving around the dial. The plumbers we called found the leak handily by casting about for a wet spot in the yard. They dug down and revealed that a tree root had grown around the line and twisted it till it cracked. “You’ve got polybutylene here,” they warned me. “You might want to think about replacing it.” Well, how much would that cost, I asked. About $2000, they said. And the repair? Oh, some $200. Reasoning that we could repair ten leaks for the cost of one water line replacement, I declined. But two years later, the whole scenario played out again. That time there was no oak tree to blame, just a jet of water shooting out of a hole in the pipe. Again, it turned a few square feet into a wetland and wasn’t hard to find. But this spring, when our bills rose yet again, our plumbers couldn’t find the leak. They dug, they probed, but finally shrugged and departed, suggesting that it might have to get worse (so they could find it) before it got better. After they left, I probed and I dug, too, till the sweat of my brow threatened to make a wet spot on the earth. (Have I mentioned our soil is Georgia clay, the same stuff that gets baked into bricks?) But after hours of hard labor, I couldn’t find it either. All the while, Nimue and I—who strive to be conservative in consumption if not our politics—were turning the water off at the meter when we went to bed at night and turning it back on before I made coffee first thing in the morning. It wasn’t all that demanding a routine, but it got tiresome quickly, especially with no end in sight. Except the end of doing the right thing and having the whole substandard line replaced. We checked our bank balance, sighed, and gave the go-ahead. Kevin and Jimmy showed up the next day with a yellow mini-monster of an earth-mover and a will to get the job done. All along I’d feared having to cut our concrete driveway (the line runs under it), but they assured me they knew a trick or two. They found the two ends on either side of the slab, snaked a cable through the existing line, winched a splitter back through it, and then threaded the new line through the tunnel they’d made. It worked a charm. Before the middle of the afternoon they were gone, the driveway was still sound, the bill was $1300 instead of $2000, and we were looking forward to going to sleep without having to make the trek out to the meter in the dark. In sum, when next we learn that we’ve got a structural issue that tends to lead to inefficiency or waste, we plan to address it sooner rather than later. Comments welcome … have you a story about shedding waste by means of an upgrade? I devoured Ms. David’s amazing book—half history, half cookbook, and all celebration—as if it were bread. And learned from her the critical secret, the deft touch: don’t worry. Yeast are resilient. All they need is time, plenty of time. Cut the amount in the recipe in half, and let the dough rise all night. Suddenly, the magic worked for me. I could make bread! And bread I made: hearty chewy rolls that sustained me and amazed and fed my grateful friends. Which (rolls and friends) were honored guests at the rehearsal dinner before the wedding Nimue graciously consented to appear at with me. A year later, we moved to a tiny town downstate, where I was called as minister of a congregation that gathered for dinners with religious frequency and vigor. I knew I couldn’t fry chicken that was safe to eat, and my scalloped potatoes turned out tough as shoe leather, but hey, I could bake happy little loaves that even farmwives hailed. “Our preacher makes homemade bread,” they bragged to the Methodists. And come our first Christmas there, the church-folk honored my craft by giving us a bread machine. I can make better bread than the bread machine. But in our busy lives that seek to balance many goods as we pursue the Good, the machine makes acceptably good bread much more often than we would by hand. Over twenty years, it cranked out hundreds, possibly thousands of batches. Twice we replaced the pan (the shaft at the bottom is a weak link). The bread machine kneaded on … till now. The mandrel about the main drive shaft has worn enough that it binds. Repair parts are unavailable. 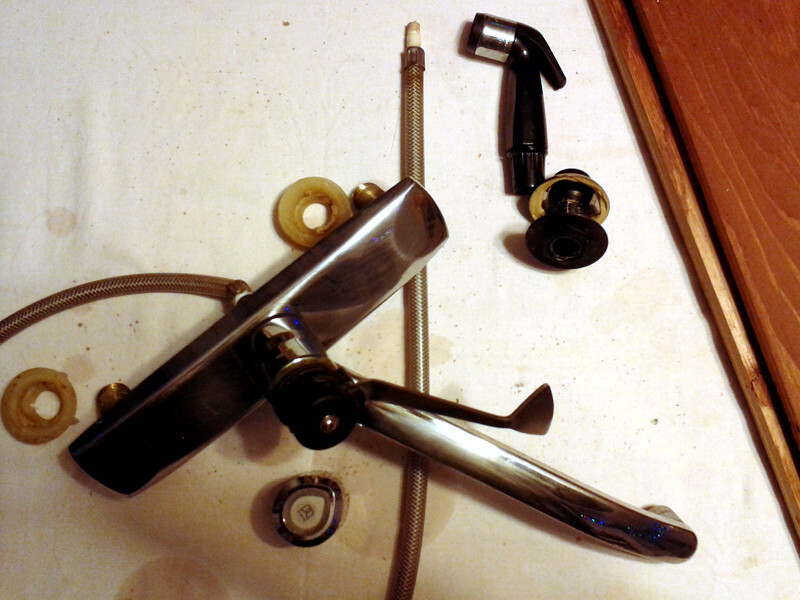 I took it apart, but without recourse to a machine shop, I couldn’t see a practical way to fix it. Our faithful bread machine is, in a term that says much about “consumer goods,” B.E.R. … Beyond the cost of Economical Repair. To the electronics recycling dropoff at the landfill it shall go. The new (used) bread machine is smaller and fussier than the old. We’re still growing accustomed to it. But it’s making bread, and we’re eating it. It may not be best, but it’s better than buying bread in a plastic shroud. Comments welcome … what compromises do you find yourself accepting in order to enjoy a “less is more” life? 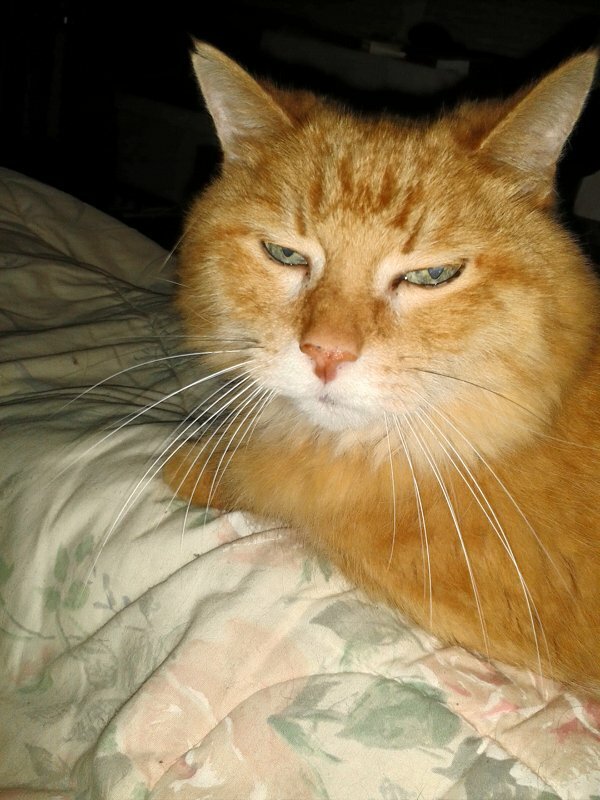 Fox has always been fairly social and affectionate toward his humans, but never much of a lap-cat. He loved to “clump” with Percy instead. Since Percy’s been gone, though, Fox has begun to claim my lap when he wants contact and comfort. I grieve with him at his loss, and don’t mind that I’m his second choice. The data set is small … okay, minuscule … but for me, here’s evidence that government programs to encourage conservation really work. Nimue and I are pretty green—at least, we hope and intend to be—and we’ve meant to replace our current showerheads with low-flow units for years. We haven’t followed through, however, until now. In an unusually (for it) environmentally aware gesture, our state of residence declared a “sales tax holiday” over the weekend for “WaterSense” and “Energy Star” products. 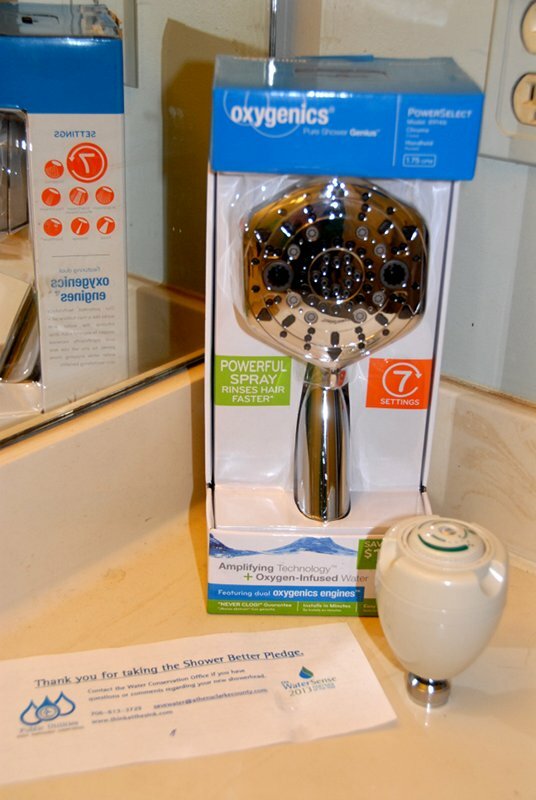 We welcomed a seven-percent savings, and even more wanted to acknowledge the initiative, so yesterday morning we rode “Early” the tandem to the Big Box Home Improvement Warehouse and came away with a showerhead that spits out just 1.75 gallons per minute. Even more generously, our community’s Water Conservation Office is giving low-flow showerheads away all month long. I picked up one for our upstairs guest bathroom. Whether it’s done for economy or commitment to sustainability, conservation is a good investment for both households and communities. We’re grateful for the gifts and the nudge. Comments welcome … did you know that, in homes equipped with electric water heaters, about 25% of energy use is to heat water for showers? Nimue and I were early adopters of compact fluorescents. (Our first was a pre-curly-q-version that required its own transformer to operate … I used it in my bedside reading light.) We loved their energy efficiency and longer life. So we made a big infrastructural investment in buying them. We’ve used them for over a decade, and they’re only now burning out. I think the only incandescent bulbs left in the house are in appliances or have odd bases—except for those in our dining area chandelier. It has a dimmer switch, which won’t work with CFLs. But now that LED lamps are mainstream, much better tech has arrived, without the mercury pollution concerns of CFLs. I started our migration today with the purchase (on a closeout sale at the Big Box Home Improvement Warehouse) of three chandelier-type bulbs. We burn that light a lot, so it’s efficient to change it over first. Even on closeout, the LEDs weren’t cheap (about $13 each), but they reduce our energy use for that fixture by about 90%, immediately and permanently. And they’ll last so long, we may be able to will them to our nieces and nephews. 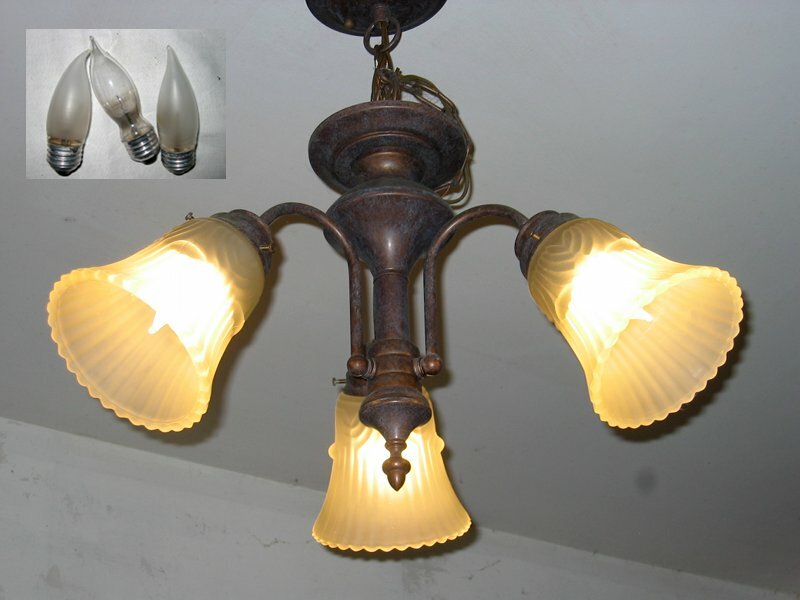 Comments welcome … to spread out our cost of conversion, I plan to upgrade one fixture per month. Do you have any bright ideas about how you might switch to (mostly) LED lighting? Perhaps only an example will save us now. Last week on the Bicycle Ride Across Georgia, Float and I were happily sailing along when we came upon a railroad crossing. Such aren’t rare in the eastern United States … I’ve ridden over hundreds, if not thousands … and though they warrant concern and care, generally if you cross them as close to a right angle as possible, they are No Big Deal. From this one, however, a huge splinter of railroad tie stuck up like a caltrop, and I smacked it square on. 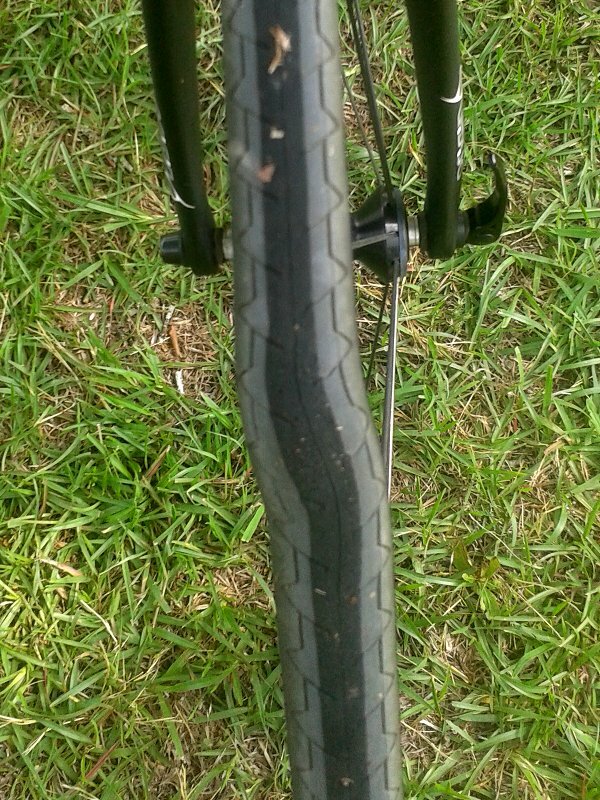 I fully expected the report of a tube puncture, and was gratified to roll on, apparently unscathed. Not so. Within 200 yards, I started hearing/feeling a “thump, thump, thump …” Inspection revealed that Float’s front tire had developed a kink big enough to rub on his brake pads. BRAG is a fully-supported ride, which means that SAG vehicles patrol the route. To my great good luck, I thought, one happened along just at the moment I realized I might need some help. (I carry a spare tube. Tire? … uh, no, not yet.) I patted the top of my helmet in the “I need a SAG” gesture, but the driver inexplicably passed by. Perhaps my friends waving their arms like monkeys introduced noise into the communication interface. In any case, it was about 10 miles to the next rest stop. I decided there was little to be lost by trying to make it. So Float and I unshed a tire. My life would have been considerably complicated without replacing it. There’s “stuff,” and there’s what I know to be useful or believe to be beautiful. I’m sickened by the former. I’m empowered and enlivened by the latter. Clarifying which is which is … well … some kind of movement into the light. Comments welcome … what might you lose that you’d really need to get back to live the life you’d recognize as the life you want to live? Today is National Bike to Work Day. I’m grateful I have the option; not everyone does. I wish I felt I could do it more often. (That’s a matter of my habits and perceptions I’ll have to take responsibility for.) But I’m grateful that, for this day, for 22 miles, I shed my use of a car. Comments welcome … does using a bicycle for some of your transportation help simplify your life? Might it? 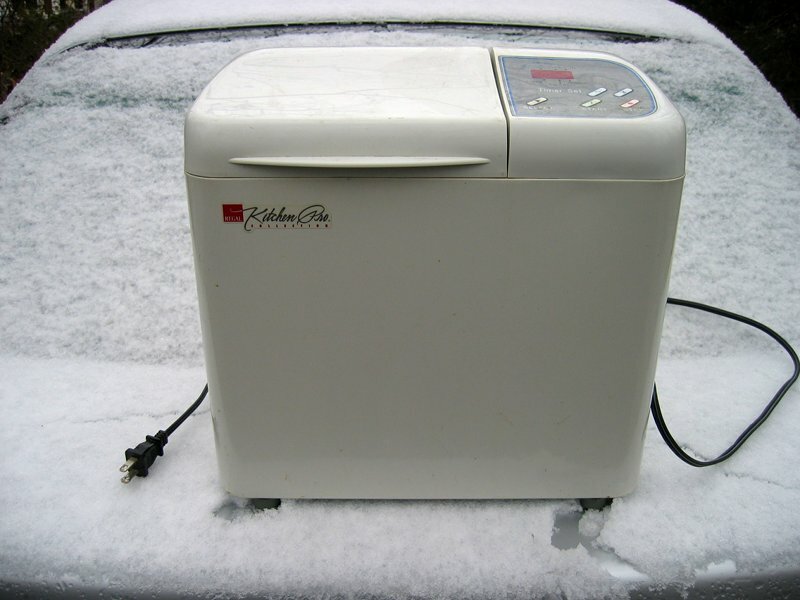 Over 20 years ago, Nimue and I received the generous gift of a bread machine. We were grateful, but a bit skeptical about the results it promised. Could it, we wondered, really make a palatable loaf? I was also puzzled about how to fit it into our kitchen and cooking. I was making rolls by hand at least twice a month and found a lot of satisfaction in doing so. Turning over the bread-making to a box seemed like a loss. But we experimented and found that it would, indeed, make good bread. Never great, but better than we could buy wrapped in plastic at the grocery store. The process was ridiculously easy, too: measure in the liquid and dry ingredients, sprinkle dry yeast on top, and press a button. So the bread machine found a place in our regular cooking routine. Now, should it break, we’d immediately replace it. Happily, our original unit is still going strong. Except that the shaft at the bottom of the bread pan, which drives the dough hook, has become difficult to turn. I expect tiny amounts of liquid and flour have leaked past the seal over the years, and now there’s enough in there to gum up the works. I vaguely recall that something like this happened to our first pan—at least I remember I ordered a replacement at one point in the now distant past. Parts are no longer available from the manufacturer. So I’ll try to disassemble the mechanism, clean the pieces, and put them back together. If it works, I’ll have shed a project off my to-do list. If not, well, there’s always eBay. It’s good to be the loving son of a mechanical engineer. 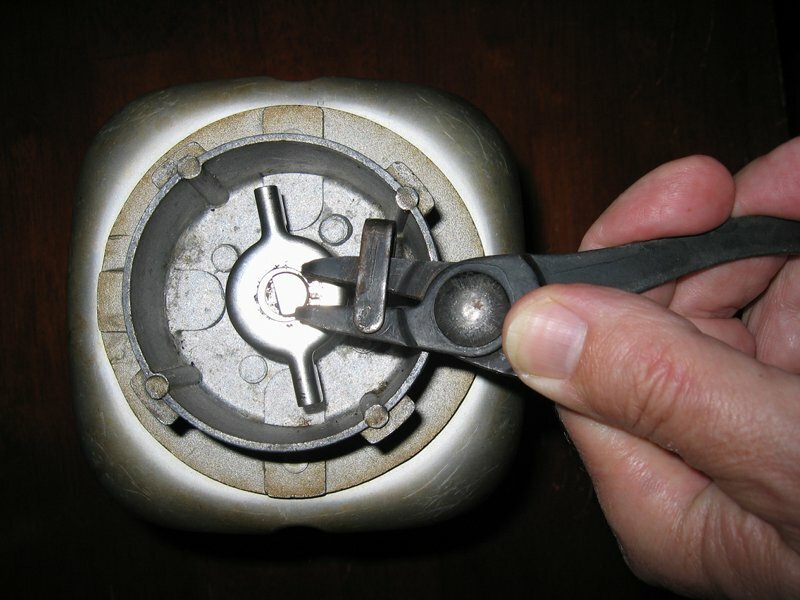 Snap-ring pliers are a household item. Comments welcome … do you have a household repair project for which it’s time to risk either failure or success? Not all that long ago, I was satisfied with my internet cyber-security. I had a unique password for every account, and I never reused one. I created relatively strong keys with mnemonic phrases. (Take the first character of “The first Earth Day was held 44 years ago on 22 April 1970” and you get TfEDwh4yao2A1, which I defy anyone to simply guess.) I stored the keys and phrases in a spreadsheet without encryption, but it was kept on a home computer running Linux behind a hardware firewall. I knew that, with the inputs of more time and trouble, I could gain greater protection, but I judged that what I was doing lowered my risks enough. In the last few months (and, I admit, if I’d really been paying attention, I’d say the last couple years), it’s become obvious that my measures were behind the times. Back when we mostly worried about computer viruses, we protected ourselves against what was essentially vandalism. It was irritating, it could ruin a day or a week (or really hurt, if you hadn’t implemented regular backups), but it was random. Now, beyond our firewalls, a very dangerous world hungers for our personal information. The thefts of Target customers’s transaction data and reports of mass filings of fraudulent tax returns point to a large class of criminals who have made computer crime their full-time jobs. They know what they’re doing, they’re cooperating, and they’re hard to bring to justice. I’d acknowledged those facts, and said to myself that I really ought to review my measures and bring them closer to best practice, when news of the Heartbleed vulnerability broke. Nuances aside, it was best to assume that any password I’d ever used on the internet was compromised and should be changed. This shed has no size, shape, nor weight in the world, but it’s big. I’m changing habits reinforced by daily practice over a period of years. My muscles knew my login to Google! Now I’ve installed a password safe on my computers and phone. I’m enabling two-step authentication where it’s possible and practical. I’m visiting every site where I have a record of an account, deleting those I don’t use if I can, changing the passwords to randomly generated, very strong keys for everything else. It feels as big a waste of time as insomnia in the night, and as hard as cycling into a 20-mph headwind. I hate it. But I’ll keep at it till it’s done. And I urge you to do the same. Because the best way to stop these crooks is for we, the herd, to make ourselves immune: install strong locks and let ’em starve out there. And insist that the corporations that have our data treat it as if we were top-tier stakeholders … which we are. Comments welcome … keeping in mind that WIST is G-rated, what burden is computer security to you?